Tanda and Chris21 is run through a flat-file integration, where a file will be exported out of Tanda with your Timesheets which you can import into Chris21. This article will take you through any requirements for integration and how to bulk import your staff into Tanda the first time and then options for new staff going forward. You can change it so it consolidates shift by the pay period end date. To do this, check the button and click Save at the bottom. You will need to download a "Tanda Approved Report", if you don't have access to it please contact our Support team on the details at the bottom of the article or Chris21. 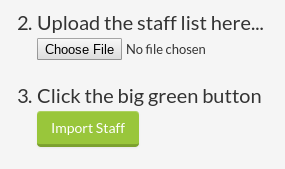 Once the import has finished, you'll see a list of your staff that have been imported into Tanda, click Complete and then your staff list will now show under Workforce > Staff. Use Employee Onboarding: this sends the new employee an App to fill in their details and you can then use the data to create a profile in Tanda. When you click the button, a file will be downloaded to your computer. The file has the extension.DAT . When processing your pay run in Chris21, you need to place your downloaded file to your directory location. Use the File Locations (FLC) form in Chris21 to check or specify an alternative directory for the Timesheet Import input file. Note the name of the Timesheet Import input file must match the 'File Name' field specified in the Timesheet Import (TCB) form. Once you've placed the file in the correct location with the correct name, go to the Timesheet Import (TCB) form and run the import. Chris21's import of your attendance data may take some time. When it’s complete, you can fix any errors that may have occured, then continue to process your pay run.